Here is a list of available One and Two day Patchwork and Quilt Workshops. Please feel free to request other subjects. contact me. This workshop requires two days. During the workshop you will learn the easy route to designing a traditional wholecloth quilt approximately 90cm x 60cm. You will transfer your design to fabric then learn how to stitch a lovely heirloom quilt. In the Multi Layered Reverse Applique Workshop you will not be producing a traditional ‘mola’ with lots of hand turned reverse appliqué but will learn a modern machine stitched version. It will still have a number of layers and different fabrics but the dedication required to needle turn each layer and slip stitch in place will not be needed. If you just breathed a sigh of relief, this workshop is probably one you’ll enjoy. If your sewing machine has lots of decorative stitches you can employ them to the full, enhancing the reverse appliqué cut aways. The only hand work will be cutting away sections of the top layer with small sharp scissors and adding beads for further embellishment. This workshop is fun to do, with the additional merit that it gives you some control over the colours of fabrics you can produce for yourself. The dyes we will be using work best on natural fibres – cotton/silk/wool etc. Once you have gained some dyeing experience, you can go on to experiment with shibori, tie dye, batik etc and build on the basic skills you will learn in the workshop. 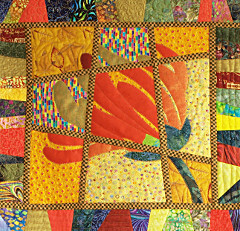 Free Cut Curves Patcwork and Quilting Workshop. At the Free-cut Curves Patchwork and Quilting Workshop, rulers and accurate piecing go out of the window and you throw yourself into free cutting and a whole new approach to patchwork. The addition of a few prairie points adds a little more fun to this lively workshop. Normally done entirely by hand, in this workshop you will learn how to produce this lovely three-dimensional block using a mix of hand and machine work. It looks complicated but breaks down into simple steps. You will make four blocks in the workshop, but by adding more blocks, the Cathedral Window design can be used to produce lovely bags, which make delightful presents. The New York Beauty block is made using foundation piecing, which makes fine points much easier to achieve. It is a superb technique which gives a very professional look. Piecing the curves is done by more traditional methods. Offsetting the blocks gives a jaunty look to the quilt top. There are a number of optional layouts for the New York Beauty block. A challenging, but fun, workshop..
Notan is based on a Japanese paper cutting system which can be very intricate. In this workshop I take a more basic and easily achievable approach to the process and apply it to fabric. It is fun to do and once you have the idea, you can play with it – I have seen some dramatic results.. Although you will be working small during the workshop, due to time constraints, you can work on a larger scale in your own time. Silk painting is easier than most people believe. Usually I hear ‘ I can’t draw’, so I make the workshop more approachable by bringing along drawings which can be traced onto the silk. There is a delight in watching the paint gently flood into each resist controlled area and seeing the image develop on this lovely fabric. I have never tired of this technique and have used it to produce some of my favourite quilted wall-hangings. To the original form of magic tile block I have added appliqué. During a one day workshop you will choose an appliqué to add to each of four separate square backgrounds. You will then cut up the squares, rearrange them and begin to assemble using joining strips.. This is a busy workshop which can benefit from being done over two days to ensure that the four blocks are assembled and there can be discussion of how to complete the quilt top. To enquire about workshops or talks, email me or call 01248 716316. or 07941 102185.